We offer 5-days for domestic orders (India) and 10-days return/exchange policy on cross border orders (International). Product can be return for refund/exchange it should be new, unused and unworn. The only exceptions is Personalized, Customized and items sold during discount SALE – these items are FINAL SALE ONLY. In any case buyer has to intimate us within 5 days from the date of delivery of the product. If buyer location is covered by FedEx pick-up service we will book reverse pick-up from customer location. Where FedEx services are not available, buyer has to manage return shipping by own. It is buyers responsibility to pack the parcel safely and paste the proper return shipping labels over it (Return address is mentioned below). If return shipping is scheduled by us, please keep the package ready on scheduled date & time and please include the original invoice, Invoice is mandatory while returning any item with FedEx. As soon as we receive product after inspection we will refund the actual amount to original mode of payment used by buyer during checkout, Cash on delivery amount will be credited to bank account via Bank NEFT (COD charges are non-refundable). In case of replacement or exchange of product will be shipped within 24-48 hours. You can exchange an item purchased on gehnastore.in with the same item or another one, however, all exchanges are subject to stock availability. 10 – days return policy applicable for international orders (pay-pal refund/exchange only). Unused and unworn items that still have the tag attached. The only exception is for Personalized, customized or items on SALE – these items are FINAL SALE ONLY. Buyer is sole responsible for return shipping charges. We are unable to refund any international return shipping charges. 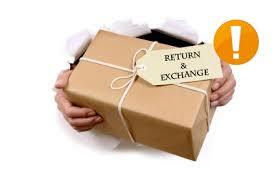 Item should be properly packed and shipped to our office address for processing your refund/exchange. To process a return/exchange, please intimate us via email and then follow the instruction given by us.